How do we teach critical thinking skills to students? Critical thinking involves looking at problems in new ways and making connections across subject areas and disciplines (Johanning & Ellis, 2013). Critical thinking skills are believed to be imperative for developing skills such as objectivity, honesty, empathy, and self-regulation. Students benefit when these skills are explicitly taught (Kivunja, 2015). 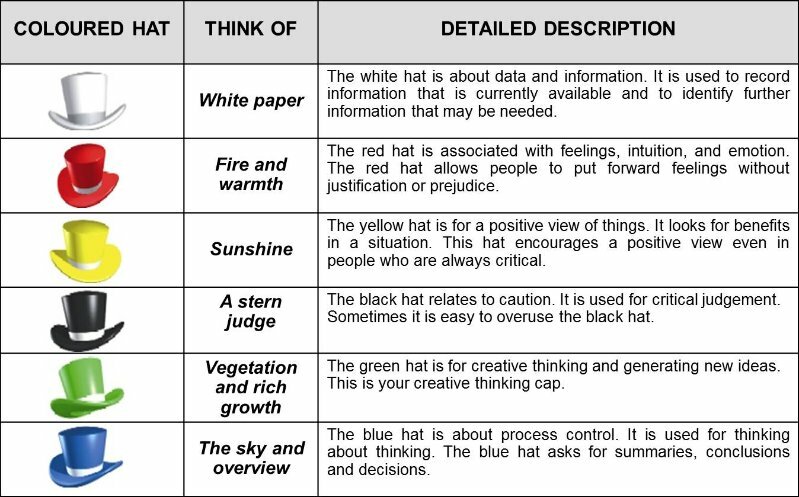 DeBono created the Six Thinking Hats Model (1992) to represent six different cognitive approaches to critical thinking. The power lies in the individual’s ability to wear one hat, assess a situation, and wear another hat. Each hat represents a different cognitive approach to a situation and to overcome the three fundamental difficulties in order to solve a problem. All are of equal value. Here are characteristics of each of DeBono’s six thinking hats, some suggested questions offered by Kivunja (2015), and my own beginning list of classroom application ideas. Why might this plan not work? What might go wrong? What are weaknesses in this strategy? What consequences will flow from these actions? Is what we are proposing fair? What is the purpose of what you plan to do? What are we trying to achieve and how do we get there? Can you explain how you reached that conclusion? What strategy might help us to complete this successfully? How can you modify or improve what was just said? How many ideas can you brainstorm? Can you use a graphic organizer or concept map to generate further or better ideas? What do you like or dislike about this idea? What do you find interesting about this? What about this idea is boring or exciting? Why do you prefer choice A over choice B? how do we get the information we need? How is the information you have relevant? How does this help us understand the concept or solve this problem? What information here seems most important? How can we gather the data we need? How should we analyze the data we have? How reliable/valid is this information? why will an idea work? what is the likelihood for success? What good points can you summarize from this? What are the benefits to the group? the class? the school? or community? What value do you see in this? If we could change the situation, what could we do to make the situation better? The PBL approach lends itself really well to incorporating the six hats! Use a timer to give groups a set amount of time to analyze their project and their work through various hats throughout the process. For example, in the beginning of the project, you may want to give groups 10 minutes to use the green hat to see if they can come up with any additional/better ideas. Towards the middle of the project, give groups time to use the blue hat to get a birds eye view of their approach and their progress. Ask students to look at the chart and assess which hat(s) they are most likely to consider naturally during a challenge. What are the pros/cons of focusing on that perspective? Which hat would be helpful to incorporate more often? Try grouping students in ways that take advantage of their natural “hat personalities” while trying a fun challenge – does this impact how the group functions? Literature Circles: assign each group member a different hat color to consider for an assigned chapter: how does the reading experience change? Assign or have students rotate through the different hats throughout a lab. What is the value of having each perspective? Which hat (type of thinking) is most important during the beginning of the experiment? middle? end? During studies of history or culture, ask students to consider the cultural differences from the perspective of each hat. How does this change the conversation? Assign roles to various students to approach a game setting using the different hats. Which type of thinking is helpful when? Which thinking proves helpful during what sport? DeBono, E. (1995). Serious creativity. The Journal for Quality and Participation, 18, 12-18. Johanning, D. I. & Ellis, A. (2013). Mathematical practices that promote 21st century skills. Mathematics Teaching in the Middle School, 19(3), 132-137. Kivunja, C. (2015). Using DeBono’s six thinking hats model to teach critical thinking and problem solving skills essential for success in the 21st century economy. Creative Education, 6, 380-391.